Prepare ye the way. 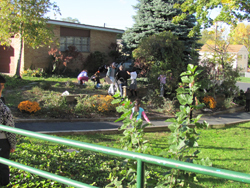 As the fall started to get colder the Garden Club of Assumption Catholic School prepared to winterize their garden. The koi were brought in from the cold and will spend the winter months as guests of the Kindergarten class. The vegetable garden was harvested one more time and the plants removed and weeded for the last time this year. The garden will be brought into the school and students will grow in their vegetables in a hydro-phonic station during the winter months. 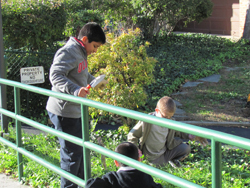 The students of the Garden Club bring the fall session to a close as they plant the last plants of 2010. They then went inside to celebrate by eating flowers. A cake in the form of a flower pot which was made by the Perth Amboy Votech, under the guidance of Mr. Moir.